7 of my favorite sketchbook assignments' handouts for high school students all in one bundle! I have also added a shading vocabulary handout that is super helpful as you begin talking about values and shading. This is a visually dynamic instruction page, front and back, on how to tackle a technical/ traditional observational drawing. 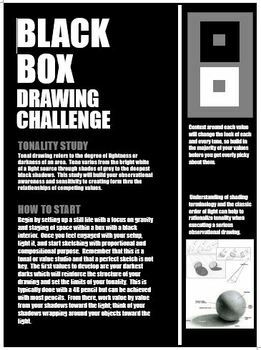 This drawing utilizes a box with an interior painted black in order to create a dramatic lighting situation for a tonal still life. 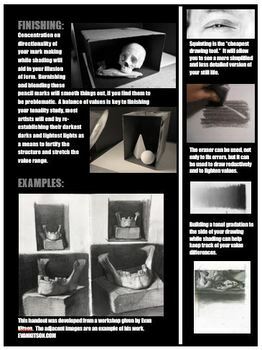 This is a high level instruction and reminder sheet for drawing.